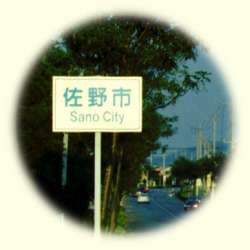 Sano is a town on the edge of the Kanto Plain. Well, that's how I think of it, but the sign on the left shows it must be a city. Can we see Mt. Fuji? You wouldn't think that a geographic feature on the scale of the Kanto Plain would really have a sharp edge. (Try finding the edge of the Severn Valley, or noticing exactly when the Urals start when you're on the trans-Siberian express.) But it does! The photo below was taken about 30 minutes by bicycle from where we live. 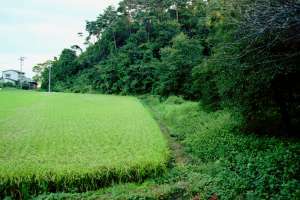 The paddy field on the left is on the Kanto Plain - now you might get enmeshed in concrete jungle, but in days gone by you could have walked from here to Tokyo Bay, going from one paddy to the next. 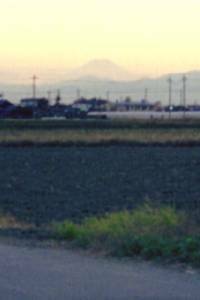 The scrubby hill on the right is the beginning of the mountains. Basically everywhere remaining white in the map above is mountain, of one size or another.